So I recently found I have a grand love for portrait photography. Mostly thanks to Santa and the Canon T3i he so graciously brought me 🙂 I took this picture of my daughter a couple weekends ago, and I love the way it turned out. 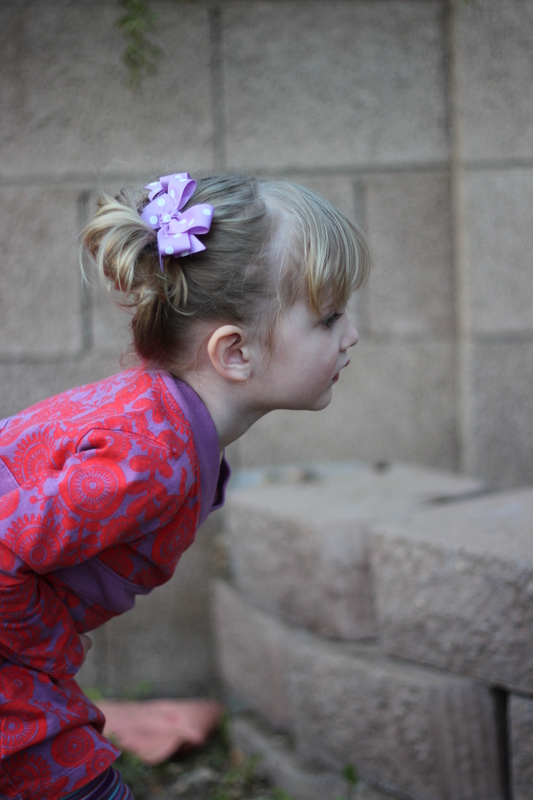 Best tidbit – that sweet looking face is intently focused on the scorpion Daddy is showing her off camera. Can’t scare this kid! Who on this planet doesn’t love a good soft pretzel? Especially a home-made one, fresh out of the oven?!? Now I’m hungry…but I’ll press on. 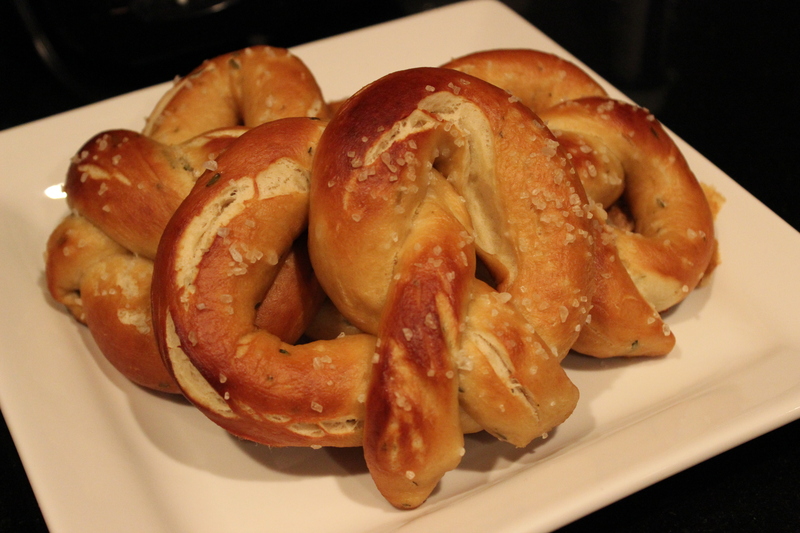 I made these Rosemary Sea Salt Pretzels a few months ago, and they were A-mazing. So I thought I’d share the recipe. 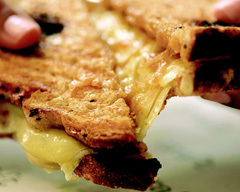 Did I mention they also include the recipe for an awesome rosemary cheese sauce? Oh yeah, no joke. This was my first official whole roasted chicken ever! I’ve cooked a turkey once, maybe twice in my life, but that’s about it. And truthfully, I’m sold. Home-cooked chicken breasts are always so dry and tasteless it seems. This chicken was perfectly juicy and moist (and we had enough left over to make an awesome Thai coconut soup the next day!) I took some liberties with this recipe though. For one, no one in my house will eat a tomato – roasted or not. So, I omitted those and chose to stuff the chicken with lemon wedges instead. And I changed my cooking time/temperature based on good friend’s suggestion – so glad I did. 1. Remove chicken from packaging and remove giblets. Rinse under cold water and pat dry. 2. Stuff cavity with lemon wedges and several rosemary sprigs. 3. Blend butter, chopped rosemary, salt and pepper in a bowl. 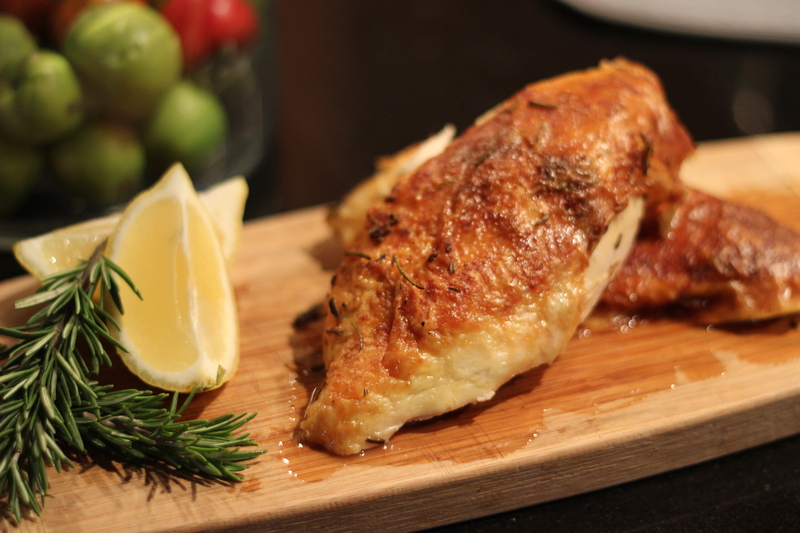 Rub compound butter onto (and under) chicken skin. 4. Tie legs together (don’t make my silly mistake first and not but the breast side up before doing this!) with kitchen string and tuck wings under. 5. Place chicken in roasting pan. 6. Bake for 1 hour 30 minutes at 425 F. Breast should reach an internal temperature of 165 F.
Any one else have some good tips for a newbie chicken roaster like myself? Like I said, I made these for my husband’s birthday last month and they were a huge hit. I personally wasn’t a fan of the cake (too dense I felt), so here’s my adaptation using the cake from the Beehive Lemon Cupcakes. 10. Remove cupcakes from tin and place on cooling rack. Allow to cool completely. 11. Using a fork, poke several holes in the tops of the cooled cakes. Spoon over about 1-2 tablespoons of the Coffee Syrup on the top of each cupcake. 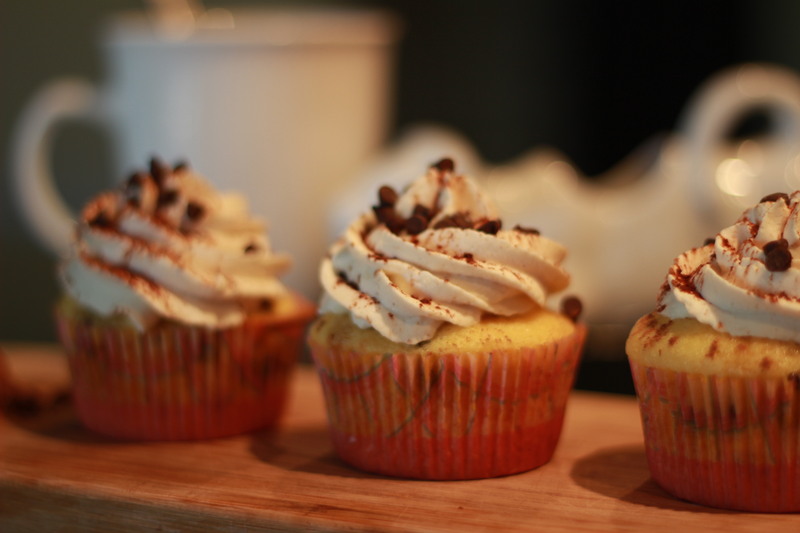 Pipe on Mascarpone Frosting and garnish with either cocoa powder and/or extra mini-chocolate chips. Add powdered sugar to coffee, mix to dissolve. Cool to room temperature. Whip heavy cream until stiff peaks form. In a separate bowl, whip the cheeses, powdered sugar, vanilla and milk until thoroughly incorporated. Gently fold in whipped heavy cream. Pipe frosting onto cupcakes with star tip. Dust with cocoa powder and extra mini chocolate chips. It’s almost Valentine’s folks – time to break out the sappy cards, red roses, and mind-numbing amounts of chocolate. Why not add some cookies to the mix this year? This “beary” good gingerbread recipe turned out much better than I anticipated! 2. Mix 4 1/2 cups of the flour, baking powder, and ground ginger together in a bowl. 3. Place shortening and brown sugar in the bowl of your mixer and beat until light and fluffy. Scrape sides of bowl as necessary. Add in molasses and beat until blended (Pro-move: spray measuring spoon with cooking spray or wipe with oil to help the molasses slide out easily). 4. Beat in eggs at medium-low speed until incorporated. 5. Add half the flour mixture and mix at low speed (unless you want to look like you’ve been playing in the snow…or worse…) until incorporated. Add the rest of the flour mixture and mix again. At this point, I found my dough was entirely too crumbly, so I added about 1/4 cup milk – you do what you suits you though. 6. Using some of the remaining flour, sprinkle your clean work surface. Place dough on surface and shape dough into a half circle, flour the top. Using a rolling pin, roll out the dough until about 1/4″ thick. 7. Line the cooking sheet with wax paper or a silpat. 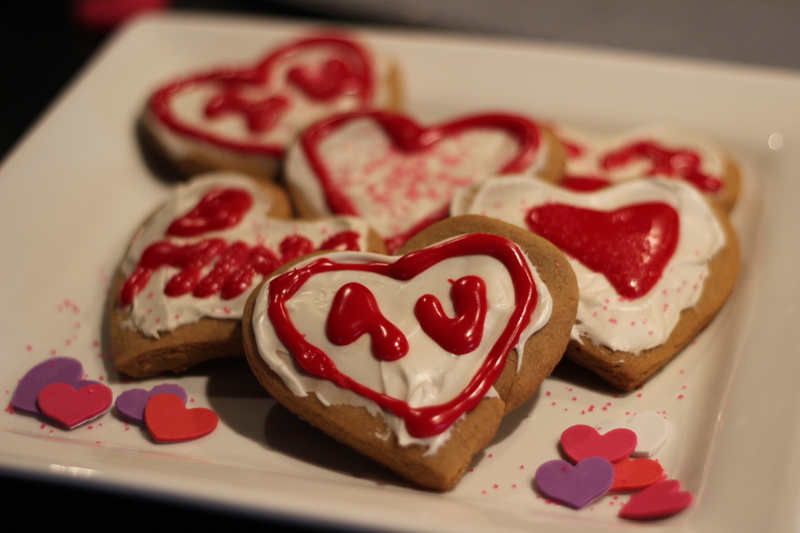 Cut out shapes with a cookie cutter (I used hearts, it is Valentine’s of course) and place them on the cookie sheet. Shape and roll out remaining dough and repeat. 8. Bake in preheated oven for 11-15 minutes. Remove when edges are slightly browned (oven mitts people!). Let the cookies cool completely on a cooling rack. 1. Separate the white from the yolk, discard the yolk (or use in another recipe). 2. Using a mixer, beat egg white until white and frothy. Beat in sugar a little at a time. Icing will get thicker right away, but will appear smooth. 3. 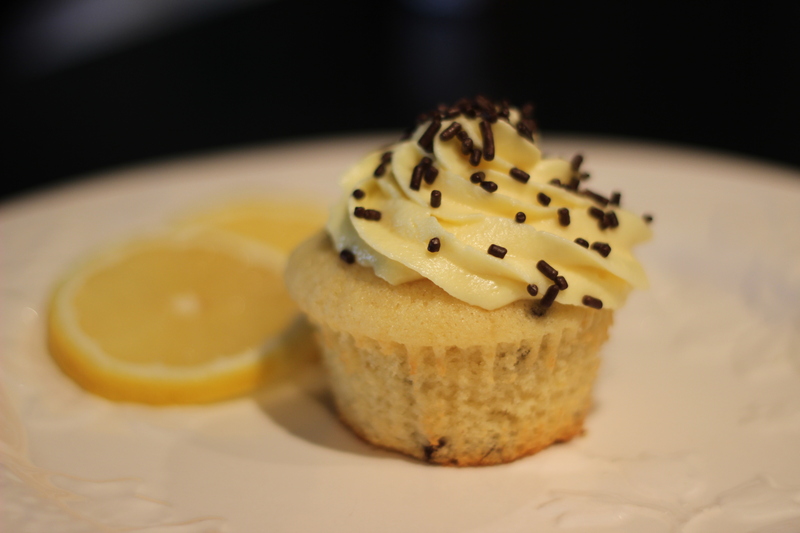 Add the lemon juice (TIL that the lemon juice is what helps the icing to harden on the cookie!) and beat again for about 4 minutes. Cover the bowl with a wet kitchen towel or paper towel so the icing doesn’t dry out. Off topic, but yes please!